Habit: Shrub, occasionally tree-like, 1--3 m, +- glabrous; sap clear; monoecious. Stem: trunk ascending to erect, branched above. Leaf: cauline, alternate, peltate; stipules fused, 1--1.5 cm, sheath-like, deciduous; petiole 1--3 dm, glandular distally; blade 1--5 dm, +- round, palmately 7--11-lobed, sharply toothed. Inflorescence: panicle, terminal, 1--3 dm; staminate flowers proximal to pistillate flowers. Staminate Flower: sepals 3--5; stamens many, clustered; nectary 0. 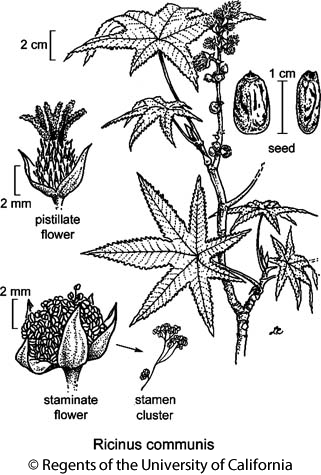 Pistillate Flower: sepals 3--5; ovary 3-chambered, bristly, styles 2-lobed, plumose, +- red. Fruit: 1.2--2 cm diam, +- spiny. Seed: 9--22 mm, smooth, shiny, mottled; scar appendaged. Chromosomes: 2n=20. Citation for this treatment: Mark H. Mayfield & Grady L. Webster 2012, Ricinus communis, in Jepson Flora Project (eds.) Jepson eFlora, http://ucjeps.berkeley.edu/eflora/eflora_display.php?tid=41486, accessed on April 24, 2019. GV, CCo, SCo, expected elsewhere; Markers link to CCH specimen records. Yellow markers indicate records that may provide evidence for eFlora range revision or may have georeferencing or identification issues. Purple markers indicate specimens collected from a garden, greenhouse, or other non-wild location.